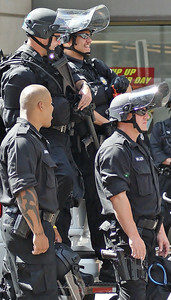 Police in riot gear in formation while on duty at the 2008 Democratic National Convention, in Denver, Co.
Police in riot gear, on duty at the 2008 Democratic National Convention, in Denver, Co.
Police officer armed with automatic weapon, on duty at the 2008 Democratic Convention in Denver, Co.
Police officer in riot gear, armed with automatic weapon, on duty at the 2008 Democratic National Convention, in Denver, Co.
Police outfitted in riot gear, standing in formation while on duty at the 2008 Democratic National Convention in Denver. 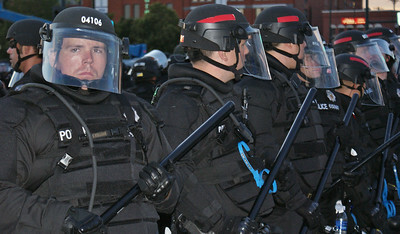 Police officer in riot gear with face shield raised. 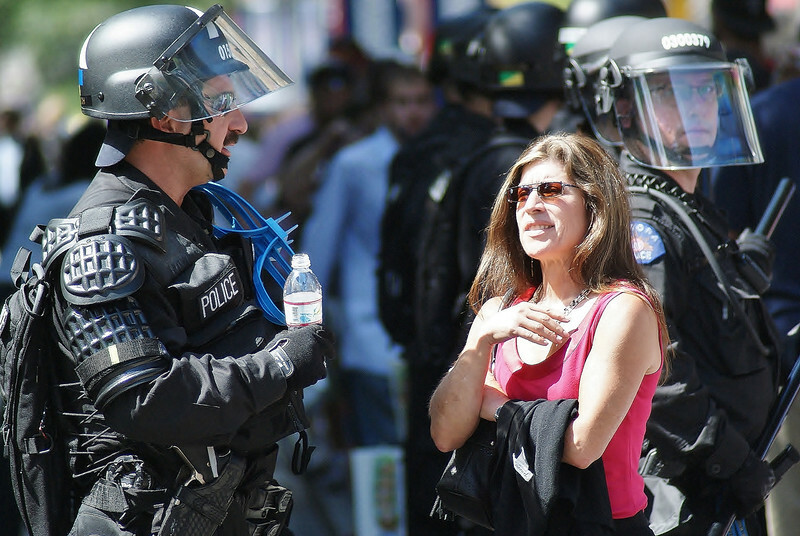 Police officer in riot gear at 2008 Democratic National Convention in Denver, chatting with a woman on the downtown mall. 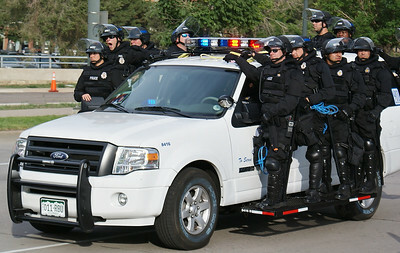 Police in riot gear, share a laugh while on duty at the 2008 Democratic National Convention, in Denver, Co.
Police in riot gear, riding on the running boards of a police SUV, on duty at the 2008 Democratic Convention in Denver. 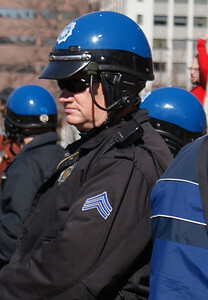 One officer yawning. 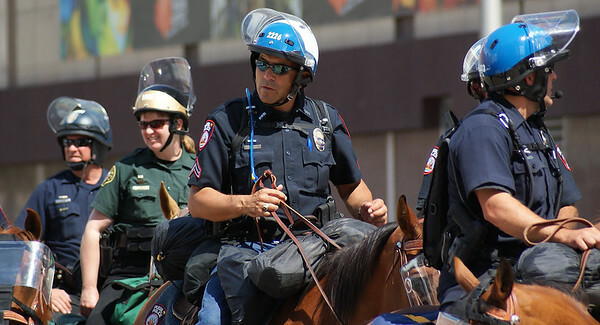 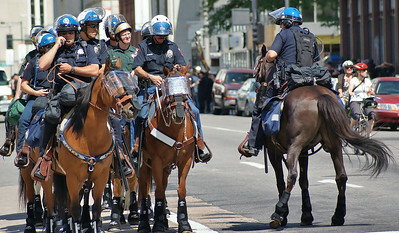 Police on horseback, on duty at the 2008 Democratic National convention in Denver. 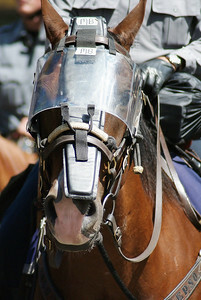 Police horse with protective gear, on duty at the 2008 Democratic National convention in Denver. 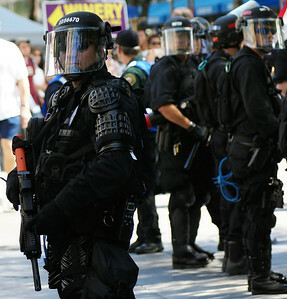 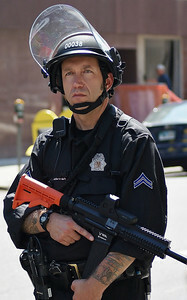 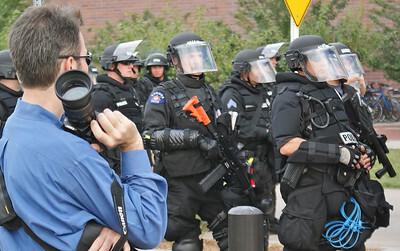 Police officer in riot gear and carrying an automatic weapon, while on duty at the 2008 Democratic Convention in Denver, in front of them man holding camera. 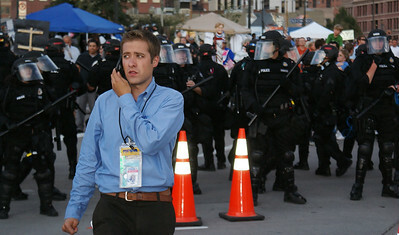 News media photographer, talking on cell phone,looking apprehensive, standing in front of a formation of police in riot gear, at the Democratic Convention in Denver. 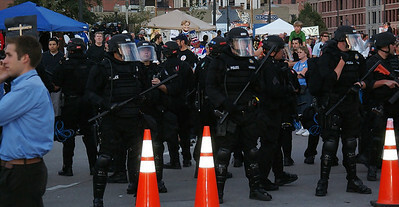 line of police in riot gear, in background large number of spectators. 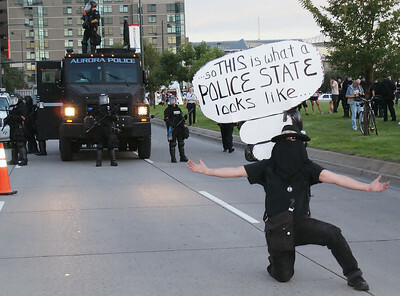 Protester at the 2008 Democratic Convention, commenting on police in riot gear and armored police vehicle. 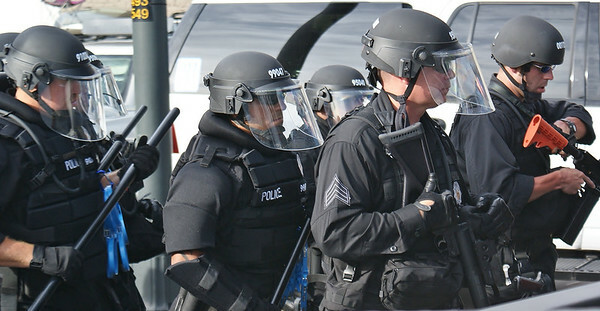 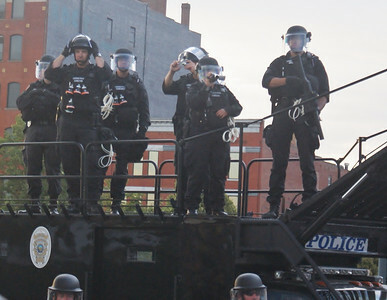 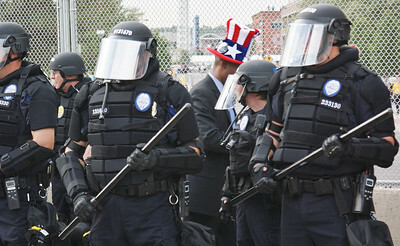 Police in riot gear with battons, behind them a man in large "Uncle Sam" hat passes by. 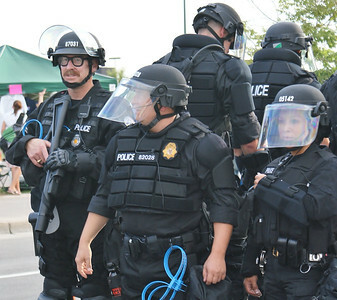 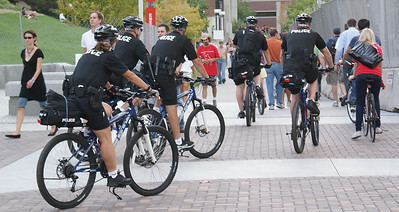 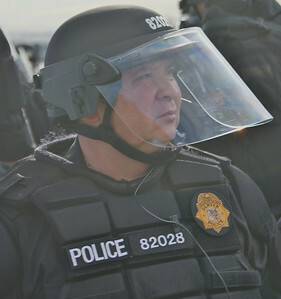 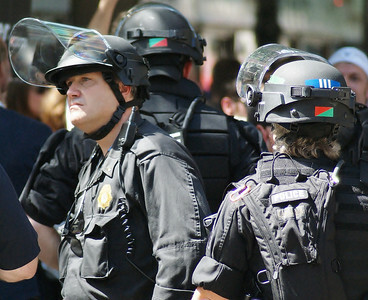 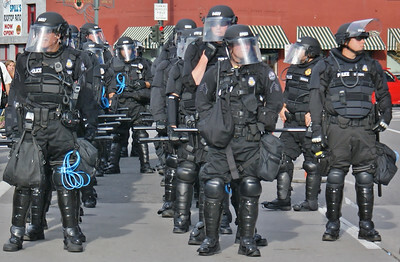 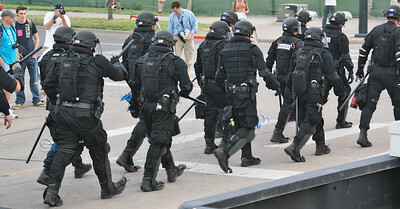 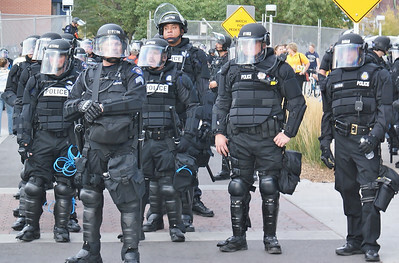 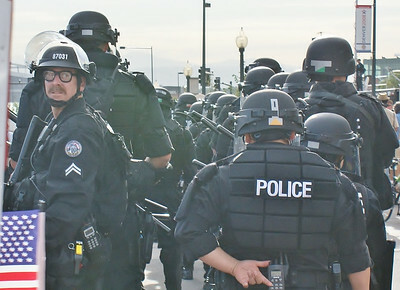 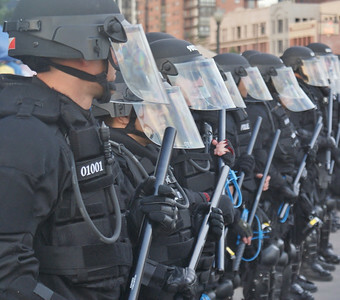 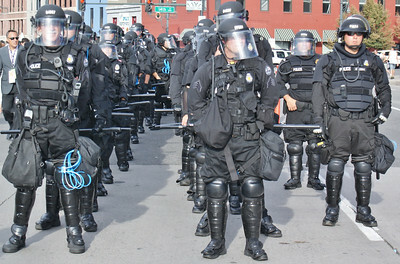 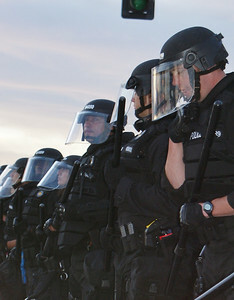 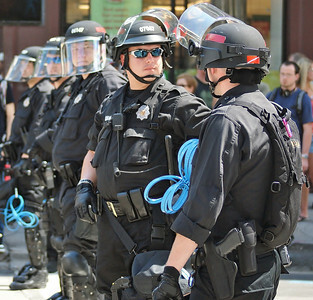 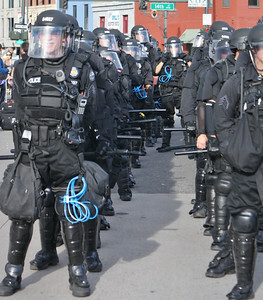 Police sergeant with group of other police officers, in riot gear, on duty at the 2008 Democratic Convention in Denver. 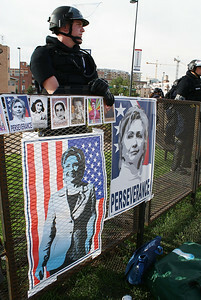 Police in riot gear, marching in formation while on duty at the 2008 Democratic Convention in Denver, Co.
Police officer in riot helmet, on duty at the 2008 Democratic National Convention, in Denver, Co.
Police officer in riot gear standing behind a fence, Hillary Clinton posters on fence. 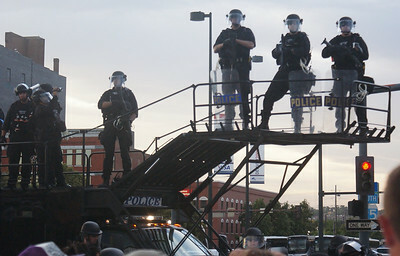 Police on elevated platform, in riot gear, armed with tear gas guns. 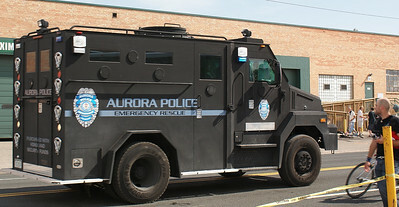 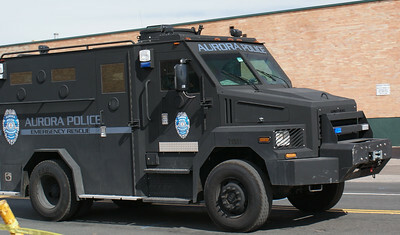 Armoured police vehicle with "Aurora Police" on the side. 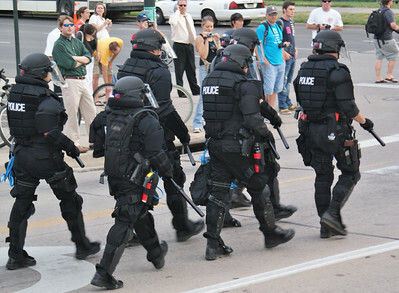 Line of police in riot gear standing up against a wall. 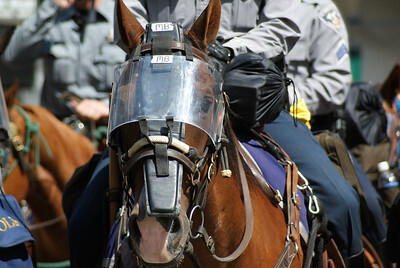 Police on horseback at an Occupy Denver protest at the Walmart distribution center in Loveland, Co.
Police on patrol on bicycles at the 2008 Democratic Convention in Denver. 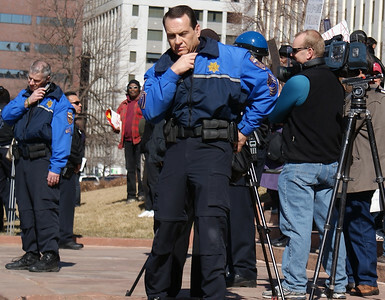 Denver police officers talking into radios, on duty during a protest at the State Capitol in denver, Co.
Denver police officers on duty during a protest at the State Capitol in denver, Co. 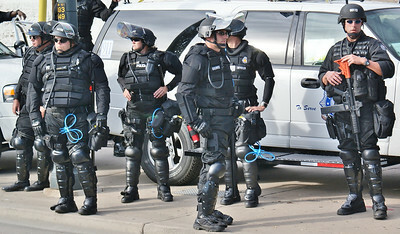 Protesters are arrested by police after blocking trucks trying to exit a Walmart distribution center near Loveland, Co.